Sometimes, where you study is just as important as what you study. Numerous studies have found that the place—or “context’—in which you study affects how you’ll remember that information. Of course every student knows this, since all of us have tried to read in a loud cafe or at an aunt’s house on Thanksgiving or while a roommate is practicing guitar. Some study sessions are more effective than others. Healthcare students have so much information to learn, that sometimes every second counts. Even if you can’t make nearby people whisper like they’re in a library, this is ultimately good news, because you have a lot of control over where you choose to study. Wherever you live, wherever you tend to study, consider these tips for creating the best study space out of your environment. 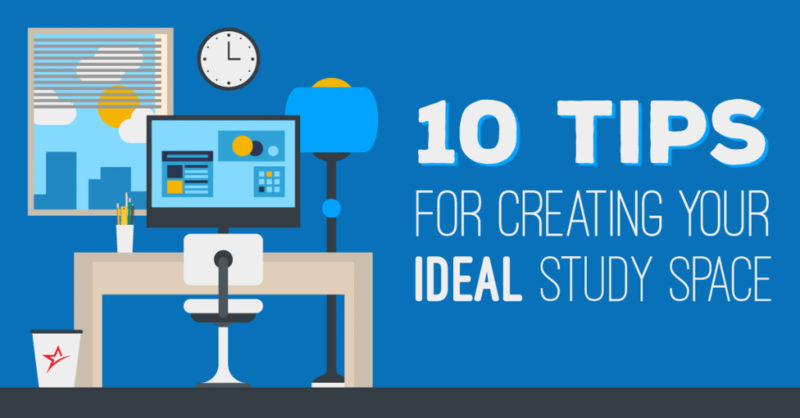 If you designate one room or area as your study space, over time your brain will catch on. You’ll enter into ‘study-mode’ sooner upon entering the space, which is an especially valuable before tests or whenever you’re crunched for time. Moving between libraries and coffee shops and friends’ apartments can be mentally jolting, since you’ll always have new distractions to process and overcome. The place you pick should be near you (ideally somewhere in your home) so it’s accessible, but it should also be a place you like. Studying can be stressful, so it’s best done in a place with colors, decór, and feng shui that appeal to you. “Context-dependent” learning means that that you’ll remember something more in the place where you first learned it. So, if you studied Maslow’s Hierarchy of Needs in a lecture-style classroom with big windows, you may recall them best in that same or a very similar classroom. This means that you should create a study space that evokes the same atmosphere as where you’ll be tested on that information. Obviously, you can’t stage your apartment with desks and a lectern, but you can make a similar environment by regulating temperature, smells, and noises. Professional writers and anyone who works from home have a lot to say about this, and their advise is usually contradictory. Some people work the majority of their lives in sweat pants and a grungy t-shirt; others dress in full business attire before sitting down at the desk in their study. Because you want to enjoy the place where you study, we say be comfortable—but not too comfortable. Change out of your pajamas before you crack open your books to give your mind another signal that this isn’t lounge time, but study time. Humans love natural light. It can make or break a space, as anyone who’s worked under fluorescents for nine hours a day knows. Even a little natural light, reflected off a hallway mirror, can bring real warmth and vitality to a room, which are necessary for making the best study space. Light shining directly in your eyes is distracting, sometimes painful, and unproductive for studying. Of course, no light is just as bad, so when you’re creating your study environment, pay attention to where you place and position the lights. For reading, it can be effective to have the light behind you, going over your shoulder to illuminate your textbook. For your desk, This Old House recommends positioning the base of lamp shades at chin level, so the source is always out of view. Some students love listening to music while they review notes. Their minds really can focus—but more than a few would still probably focus better with no music. Songs can put you in a good mood, but if you’re paying more attention to lyrics than the procedures you’re supposed to learn, music is counterproductive—and anyway, not something you’ll hear in a test room. Instead, try an ambient noise machine or program, or at least switch to classical music. Orchestras can produce the same pleasant effects without taking your mind off the words on a page. It’s been proven by NASA that certain houseplants improve indoor air quality, and something green and alive just makes a study space more serene. If you live in your designated study space, buy a low-maintenance houseplant, like aloe or a snake plant. As long as you remember to water it, a plant can make your environment more peaceful, and easier to breathe. Don’t put it in your pocket. Don’t turn it over. Turn it off, or at least switch on airplane mode. When you’re studying, your phone can be your biggest distraction. Even just knowing it’s there, and that texts or Instagram likes might be coming through, will affect your focus. Switching it off can be mentally liberating, so unless you’re expecting an important call, do it whenever you sit down to study. Studying has a lot of negative associations, but it shouldn’t. Studying is just another word for learning, and as a healthcare student, you’re learning tasks and medical information you’ll need for your job—or even to save a life. Remember that studying is good, that it’s going to help you, and that the future career ahead of you is exciting. You can bring this positivity into your study space too, by putting up pictures of family, or quotes from your favorite book. Unless you thrive on clutter, tidy up your space regularly to keep it nice. You should also remember to reward yourself, because as good as studying is, it’s work, and you’ve earned it. If you’ve created the best study space, you’re going to love being there; it might even be your favorite part of your apartment. You’ll be tempted to do everything there—watch Netflix, sit and call your mother, and chat with friends—but whenever possible, your study space should just be used for studying. Making it a designated study area will preserve its association with learning. When you leave, and you should, your mind will realize it can take a break, and recharge until the next session. If you found this blog helpful, share it with your fellow students and let us know what makes an ideal study space for you on Facebook or Twitter.